Day 6: Faith and Life Off the Grid | You Can Shake the Gates! Day 6 — Faith and Life Off the Grid – You Can Shake the Gates! Lightning spidering across the sky on a dry season night is mesmerizing. And maddening. The clouds that spawn the lightning hold such promise and deliver so little substance. At least that’s how it seemed in the late 1990’s in Uria Village. Angela and I sat on the steps of our little house staring at the free light show, praying. We had been rationing our water as we watched the level in the fiberglass tank drop an inch or two each day. The clouds would usually gather in the late afternoon or early evening and spew a lot of lightning. No rain. Without rain we’d be unable to stay in the village for lack of water to drink, cook with, wash, etc. Day after day my attitude sank with the level of the water in the tank. I guess I felt like God owed me something. Pity parties are not useful models for prayer. “Oh God, I’ve come out here to the edge of the world to do this impossible work all because you asked me to. The least you could do would be to fill my tank to overflowing . . .” I’ll spare you the running commentary of whining. You get the picture. A few weeks of this ritual began to take its toll. My selfish demands were going nowhere. God will not be mocked or manipulated into doing my will. To fully appreciate what I am about to tell you, you have to understand the design of my office. It is 11′ x 11′, has large windows on three sides (airflow), and a corrugated zinc-alum roof with no ceiling to muffle any sound from above. I sat down at my desk, opened my Bible, but didn’t read a thing. Instead, I bowed my head and allow the broken, submitted prayer to flow. “Father, you are God. You brought us here. It’s up to you whether or not we remain in the village or go to town to wait for rain. You do whatever is fitting to You. I’m your servant, not your master.” And as I prayed, it sounded like someone was shooting the roof of my office with BB’s. Slowly at first and then a torrent opened up and a month’s worth of rain came in an hour. The boys ran outside, splashing and dancing jubilantly. I stood in the office door and just stared at the rain, slack-jawed. Angela laughed. 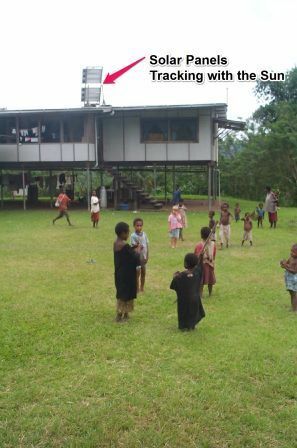 Living life off of the grid is standard fare for most Bible translators. It can be wonderful and terrible but almost always faith-building in some way. 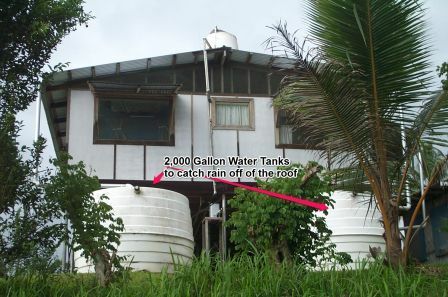 When we built our “permanent” house in 2000, we installed two 2,000-gallon fiberglass tanks to catch rain water off of the roof. We had several solar panels mounted on a home-made solar tracker. Inside the house we had an 800-watt inverter that changed the direct-current power of the deep-cycle batteries into alternating current that our laptops, stereo, and other appliances could use. For high-load items like our washing machine and power tools we had a generator like what you buy at your local home-improvement store. Our refrigerator and stove ran off of LP Gas (Propane). Not all of it worked perfectly. LP gas refrigeration is a little dicey and very finicky. Even so, these “conveniences” make the task of Bible translation doable. Why? The simple answer is that without them we would spend all of our time washing clothes in the stream, maintaining subsistence gardens, hunting, fishing, carpentry, etc. The men who work alongside us in the task of Bible translation have large extended families that do extra so that they can give time to ministry. We do not. We have Maytag and Makita, DeWalt and ProWatt and Toshiba–and once upon a time, Nissan. Many of these items will need to be replaced or repaired when we return. Would you like to join us in making this possible? If so, click here to go to the Donate page where you will find instructions about how to partner with us financially. If you’d like to come alongside us in prayer, click here to drop us an email letting us know of your desire to do so. Between now and the year’s end, we are asking God to connect us with 40 new monthly financial partners, 40 special projects partners, and 40 new intercessors. This entry was posted in Ministry News & Opportunities, Shake the Gates Press, Uncategorized and tagged cross-cultural, intercession, mercy, missionaries, off the grid, Papua New Guinea, provision, Somau Garia. Bookmark the permalink.